Statistics and Machine Learning Toolbox™, Optimization Toolbox™, and Global Optimization Toolbox are recommended for this function. fitResults = sbiofit(sm,grpData,responseMap,estiminfo) estimates parameters of a SimBiology model sm using nonlinear least-squares regression. grpData is a groupedData object specifying the data to fit. responseMap defines the mapping between the model components and response data in grpData. estimatedInfo is an estimatedInfo object that defines the estimated parameters in the model sm. fitResults is a OptimResults object or NLINResults object or a vector of these objects. sbiofit uses the first available estimation function among the following: lsqnonlin (Optimization Toolbox required), nlinfit (Statistics and Machine Learning Toolbox required), or fminsearch. By default, each group in grpData is fit separately, resulting in group-specific parameter estimates. 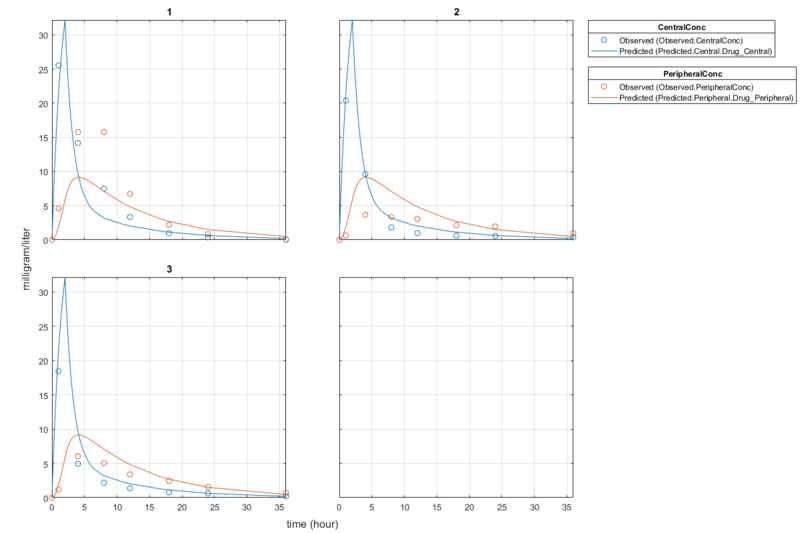 If the model contains active doses and variants, they are applied before the simulation. fitResults = sbiofit(sm,grpData,responseMap,estiminfo,dosing) uses the dosing information specified by a matrix of SimBiology dose objects dosing instead of using the active doses of the model sm if there is any. fitResults = sbiofit(sm,grpData,responseMap,estiminfo,dosing,functionName) uses the estimation function specified by functionName. If the specified function is unavailable, a warning is issued and the first available default function is used. fitResults = sbiofit(sm,grpData,responseMap,estiminfo,dosing,functionName,options) uses the additional options specified by options for the function functionName. fitResults = sbiofit(sm,grpData,responseMap,estiminfo,dosing,functionName,options,variants) applies variant objects specified as variants instead of using any active variants of the model. fitResults = sbiofit(_,Name,Value) uses additional options specified by one or more Name,Value pair arguments. [fitResults,simdata] = sbiofit(_) also returns a vector of SimData objects simdata using any of the input arguments in the previous syntaxes. sbiofit unifies sbionlinfit and sbioparamestim estimation functions. Use sbiofit to perform nonlinear least-squares regression. sbiofit simulates the model using a SimFunction object, which automatically accelerates simulations by default. Hence it is not necessary to run sbioaccelerate before you call sbiofit. Suppose you have drug plasma concentration data from three individuals that you want to use to estimate corresponding pharmacokinetic parameters, namely the volume of central and peripheral compartment (Central, Peripheral), the clearance rate (Cl_Central), and intercompartmental clearance (Q12). Assume the drug concentration versus the time profile follows the biexponential decline Ct=Ae−at+Be−bt, where Ct is the drug concentration at time t, and a and b are slopes for corresponding exponential declines. The synthetic data set contains drug plasma concentration data measured in both central and peripheral compartments. The data was generated using a two-compartment model with an infusion dose and first-order elimination. These parameters were used for each individual. The data is stored as a table with variables ID, Time, CentralConc, and PeripheralConc. It represents the time course of plasma concentrations measured at eight different time points for both central and peripheral compartments after an infusion dose. Convert the data set to a groupedData object which is the required data format for the fitting function sbiofit for later use. A groupedData object also lets you set independent variable and group variable names (if they exist). Set the units of the ID, Time, CentralConc, and PeripheralConc variables. The units are optional and only required for the UnitConversion feature, which automatically converts matching physical quantities to one consistent unit system. Create a trellis plot that shows the PK profiles of three individuals. Assume every individual receives an infusion dose at time = 0, with a total infusion amount of 100 mg at a rate of 50 mg/hour. For details on setting up different dosing strategies, see Doses. The data contains measured plasma concentrations in the central and peripheral compartments. Map these variables to the appropriate model species, which are Drug_Central and Drug_Peripheral. The parameters to estimate in this model are the volumes of central and peripheral compartments (Central and Peripheral), intercompartmental clearance Q12, and clearance rate Cl_Central. In this case, specify log-transform for Central and Peripheral since they are constrained to be positive. The estimatedInfo object lets you specify parameter transforms, initial values, and parameter bounds (optional). Fit the model to all of the data pooled together, that is, estimate one set of parameters for all individuals. The default estimation method that sbiofit uses will change depending on which toolboxes are available. To see which estimation function sbiofit used for the fitting, check the EstimationFunction property of the corresponding results object. Plot the fitted results versus the original data. Although three separate plots were generated, the data was fitted using the same set of parameters (that is, all three individuals had the same fitted line). Estimate one set of parameters for each individual and see if there is any improvement in the parameter estimates. In this example, since there are three individuals, three sets of parameters are estimated. Plot the fitted results versus the original data. Each individual was fitted differently (that is, each fitted line is unique to each individual) and each line appeared to fit well to individual data. Display the fitted results of the first individual. The MSE was lower than that of the pooled fit. This is also true for the other two individuals. 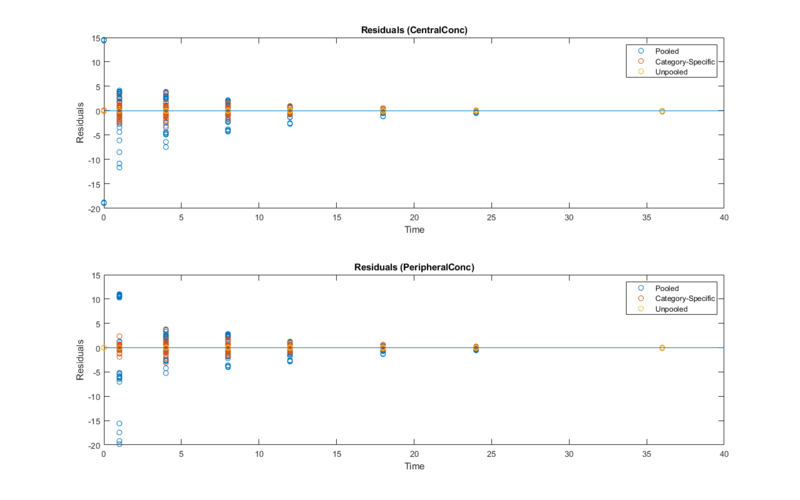 Generate a plot of the residuals over time to compare the pooled and unpooled fit results. The figure indicates unpooled fit residuals are smaller than those of pooled fit as expected. In addition to comparing residuals, other rigorous criteria can be used to compare the fitted results. This example showed how to perform pooled and unpooled estimations using sbiofit. As illustrated, the unpooled fit accounts for variations due to the specific subjects in the study, and, in this case, the model fits better to the data. However, the pooled fit returns population-wide parameters. 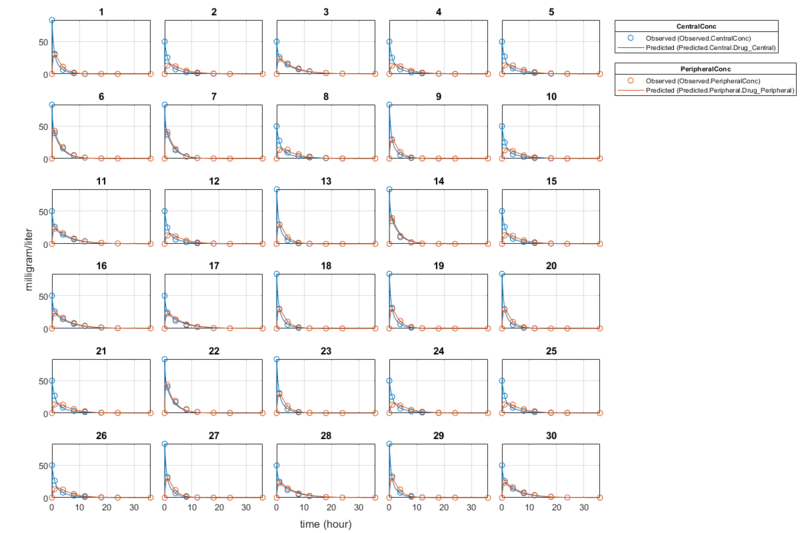 If you want to estimate population-wide parameters while considering individual variations, use sbiofitmixed. This example uses the yeast heterotrimeric G protein model and experimental data reported by . For details about the model, see the Background section in Parameter Scanning, Parameter Estimation, and Sensitivity Analysis in the Yeast Heterotrimeric G Protein Cycle. Load the G protein model. 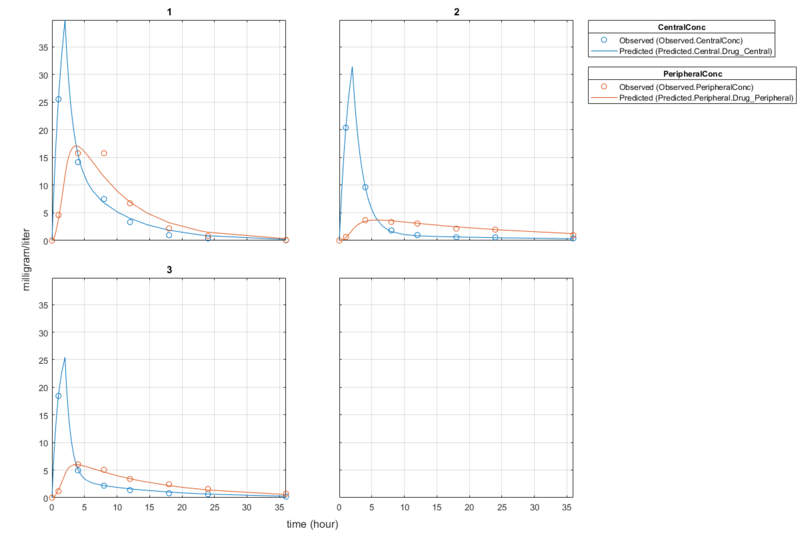 Store the experimental data containing the time course for the fraction of active G protein. Create a groupedData object based on the experimental data. Map the appropriate model component to the experimental data. 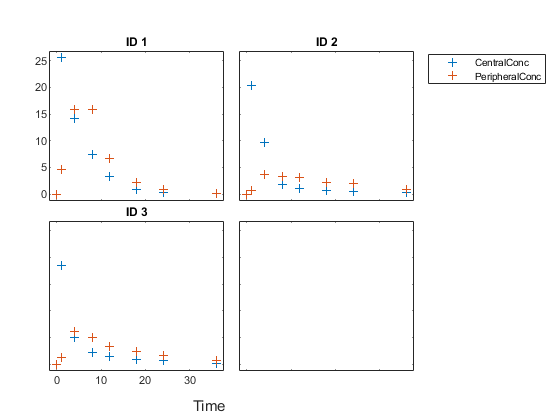 In other words, indicate which species in the model corresponds to which response variable in the data. In this example, map the model parameter GaFrac to the experimental data variable GaFracExpt from grpData. Use an estimatedInfo object to define the model parameter kGd as a parameter to be estimated. View the estimated parameter value of kGd. Suppose you want to plot the model simulation results using the estimated parameter value. You can either rerun the sbiofit function and specify to return the optional second output argument, which contains simulation results, or use the fitted method to retrieve the results without rerunning sbiofit. 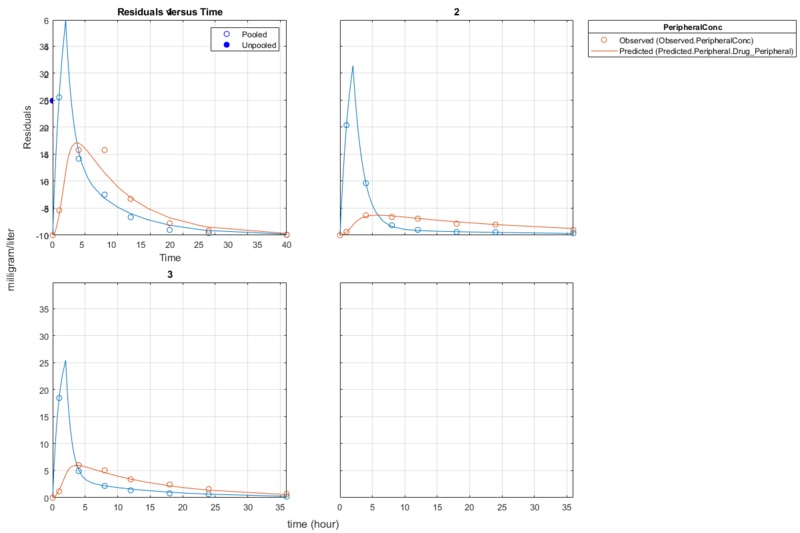 This example shows how to estimate the time lag before a bolus dose was administered and the duration of the dose using a one-compartment model. Load a sample data set. 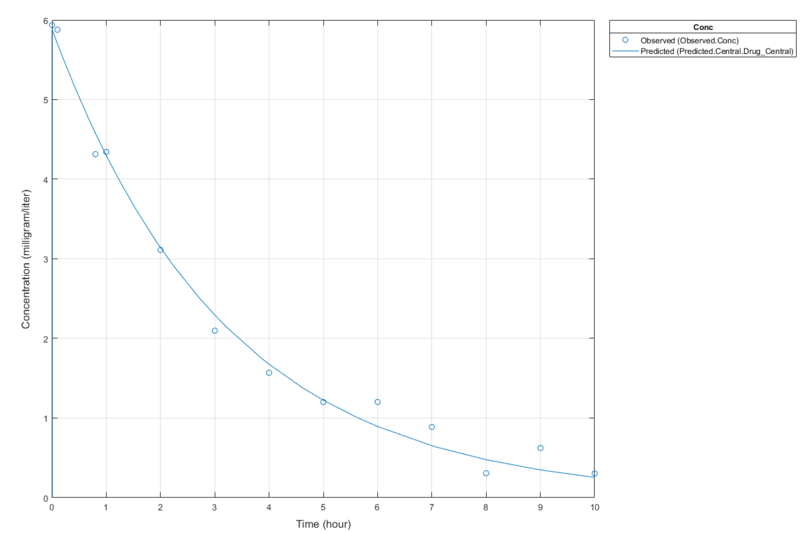 Add two parameters that represent the time lag and duration of a dose. The lag parameter specifies the time lag before the dose is administered. 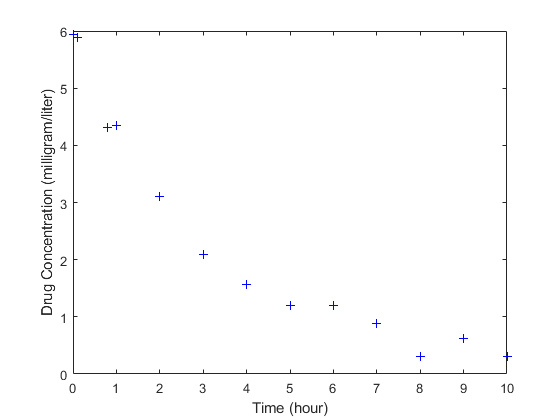 The duration parameter specifies the length of time it takes to administer a dose. Create a dose object. Set the LagParameterName and DurationParameterName properties of the dose to the names of the lag and duration parameters, respectively. Map the model species to the corresponding data. Specify the lag and duration parameters as parameters to estimate. Log-transform the parameters. Initialize them to 2 and set the upper bound and lower bound. If the data contains more than one group of measurements, the grouping variable name must be defined in the GroupVariableName property of grpData. For example, if the grouping variable name is 'GROUP', then specify it as follows. A group usually refers to a set of measurements that represent a single time course, often corresponding to a particular individual, or experimental condition. sbiofit uses the categorical function to identify groups. If any group values are converted to the same value by categorical, then those observations are treated as belonging to the same group. For instance, if some observations have no group information (that is, an empty character vector ''), then categorical converts empty character vectors to <undefined>, and these observations are treated as one group. Mapping information of model components to grpData, specified as a character vector, string, string vector, or cell array of character vectors. For example, if you have the concentration data 'CONC' in grpData for a species 'Drug_Central', you can specify it as follows. To name a species unambiguously, use the qualified name, which includes the name of the compartment. To name a reaction-scoped parameter, use the reaction name to qualify the parameter. If the name is not a valid MATLAB® variable name, surround it by square brackets such as [reaction 1]. [parameter 1]. Estimated parameters, specified as an estimatedInfo object or vector of estimatedInfo objects that defines the estimated parameters in the model sm, and other optional information such as their initial estimates, transformations, bound constraints, and categories. Supported transforms are log, logit, and probit. You can specify bounds for all estimation methods. The lower bound must be less than the upper bound. For details, see boundValues. When using scattersearch, you must specify finite transformed bounds for each estimated parameter. When using fminsearch, nlinfit, or fminunc with bounds, the objective function returns Inf if bounds are exceeded. When you turn on options such as FunValCheck, the optimization might error if bounds are exceeded during estimation. If using nlinfit, it might report warnings about the Jacobian being ill-conditioned or not being able to estimate if the final result is too close to the bounds. If you do not specify Pooled name-value pair argument, sbiofit uses CategoryVariableName property of estiminfo to decide if parameters must be estimated for each individual, group, category, or all individuals as a whole. Use the Pooled option to override any CategoryVariableName values. For details about CategoryVariableName property, see estimatedInfo object. sbiofit uses the categorical function to identify groups or categories. If any group values are converted to the same value by categorical, then those observations are treated as belonging to the same group. For instance, if some observations have no group information (that is, an empty character vector '' as a group value), then categorical converts empty character vectors to <undefined>, and these observations are treated as one group. Dosing information, specified as an empty array, or 2-D matrix of dose objects (ScheduleDose object or RepeatDose object). Estimation function name, specified as a character vector or string. Choices are as follows. By default, sbiofit uses the first available estimation function among the following: lsqnonlin, nlinfit, or fminsearch. The same priority applies to the default local solver choice for scattersearch. For the summary of supported methods and fitting options, see Supported Methods for Parameter Estimation. Options specific to the estimation function, specified as a struct or optimoptions object. See Default Options for Estimation Algorithms for more details and default options associated with each estimation function. Example: 'ErrorModel','constant','UseParallel',true specifies a constant error model and to run simulations in parallel during parameter estimation. Error models used for estimation, specified as a character vector, string, string vector, cell array of character vectors, categorical vector, or table. If it is a table, it must contain a single variable that is a column vector of error model names. The names can be a cell array of character vectors, string vector, or a vector of categorical variables. If the table has more than one row, then the RowNames property must match the response variable names specified in the right hand side of responseMap. If the table does not use the RowNames property, the nth error is associated with the nth response. If you specify only one error model, then sbiofit estimates one set of error parameters for all responses. If you specify multiple error models using a categorical vector, string vector, or cell array of character vectors, the length of the vector or cell array must match the number of responses in the responseMap argument. You can specify multiple error models only if you are using these methods: lsqnonlin, lsqcurvefit, fmincon, fminunc, fminsearch, patternsearch, ga, and particleswarm. There are four built-in error models. Each model defines the error using a standard mean-zero and unit-variance (Gaussian) variable e, simulation results f, and one or two parameters a and b. If you specify an error model, you cannot specify weights except for the constant error model. Weights used for estimation, specified as a matrix of real positive weights, where the number of columns corresponds to the number of responses, or a function handle that accepts a vector of predicted response values and returns a vector of real positive weights. If you specify an error model, you cannot use weights except for the constant error model. If neither the 'ErrorModel' or 'Weights' is specified, by default the function uses the constant error model with equal weights. Fit option flag, specifying whether to fit each individual (false) or pool all individual data (true). When true, the function performs fitting for all individuals or groups simultaneously using the same parameter estimates, and fitResults is a scalar results object. When false, the function fits each group or individual separately using group- or individual-specific parameters, and fitResults is a vector of results objects with one result for each group. Use this option to override any CategoryVariableName values of estiminfo. Flag to enable parallelization, specified as true or false. If true and Parallel Computing Toolbox™ is available, sbiofit supports several levels of parallelization, but only one level is used at a time. For an unpooled fit ('Pooled' = false) for multiple groups, each fit is run in parallel. For a pooled fit ('Pooled' = true), parallelization happens at the solver level. In other words, solver computations, such as objective function evaluations, are run in parallel. For details, see Multiple Parameter Estimations in Parallel. Flag to use parameter sensitivities to determine gradients of the objective function, specified as true or false. By default, it is true for fmincon, fminunc, lsqnonlin, and lsqcurvefit methods. Otherwise, it is false. If it is true, SimBiology always uses the sundials solver, regardless of what you have selected as the SolverType property in the Configset object. SimBiology uses the complex-step approximation method to calculate parameter sensitivities. Such calculated sensitivities can be used to determine gradients of the objective function during parameter estimation to improve fitting. The default behavior of sbiofit is to use such sensitivities to determine gradients whenever the algorithm is gradient-based and if the SimBiology® model supports sensitivity analysis. For details about the model requirements and sensitivity analysis, see Sensitivity Calculation. Flag to show the progress of parameter estimation, specified as true or false. If true, a new figure opens containing plots that show the log-likelihood, termination criteria, and estimated parameters for each iteration. This option is not supported for the nlinfit method. If you are using the Optimization Toolbox functions (fminunc, fmincon, lsqcurvefit, lsqnonlin), the figure also shows the First Order Optimality (Optimization Toolbox) plot. 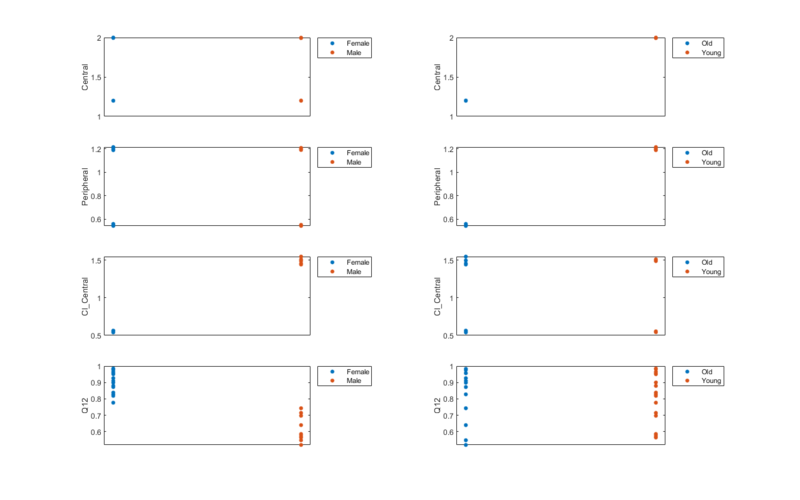 For an unpooled fit, each line on the plots represents an individual. For a pooled fit, a single line represents all individuals. The line becomes faded when the fit is complete. The plots also keep track of the progress when you run sbiofit (for both pooled and unpooled fits) in parallel using remote clusters. For details, see Progress Plot. Estimation results, returned as a OptimResults object or NLINResults object or a vector of these objects. Both results objects are subclasses of the LeastSquaresResults object. If the function uses nlinfit, then fitResults is a NLINResults object. Otherwise, fitResults is an OptimResults object. When 'Pooled' is set to false, the function fits each group separately using group-specific parameters, and fitResults is a vector of results objects with one results object for each group. When 'Pooled' is set to true, the function performs fitting for all individuals or groups simultaneously using the same parameter estimates, and fitResults is a scalar results object. When 'Pooled' is not used, and CategoryVariableName values of estiminfo are all <none>, fitResults is a single result object. This is the same behavior as setting 'Pooled' to true. When 'Pooled' is not used, and CategoryVariableName values of estiminfo are all <GroupVariableName>, fitResults is a vector of results objects. This is the same behavior as setting 'Pooled' to false. In all other cases, fitResults is a scalar object containing estimated parameter values for different groups or categories specified by CategoryVariableName. Simulation results, returned as a vector of SimData objects representing simulation results for each group or individual. If the 'Pooled' option is false, then each simulation uses group-specific parameter values. If true, then all simulations use the same (population-wide) parameter values. The states reported in simdata are the states that were included in the responseMap input argument and any other states listed in the StatesToLog property of the runtime options (RuntimeOptions) of the SimBiology model sm. SimBiology estimates parameters by the method of maximum likelihood. Rather than directly maximizing the likelihood function, SimBiology constructs an equivalent minimization problem. Whenever possible, the estimation is formulated as a weighted least squares (WLS) optimization that minimizes the sum of the squares of weighted residuals. Otherwise, the estimation is formulated as the minimization of the negative of the logarithm of the likelihood (NLL). The WLS formulation often converges better than the NLL formulation, and SimBiology can take advantage of specialized WLS algorithms, such as the Levenberg-Marquardt algorithm implemented in lsqnonlin and lsqcurvefit. SimBiology uses WLS when there is a single error model that is constant, proportional, or exponential. SimBiology uses NLL if you have a combined error model or a multiple-error model, that is, a model having an error model for each response. sbiofit supports different optimization methods, and passes in the formulated WLS or NLL expression to the optimization method that minimizes it. The variables are defined as follows. σi Standard deviation of the ith observation. When you use numeric weights or the weight function, the weights are assumed to be inversely proportional to the variance of the error, that is, σi2=a2wi where a is the constant error parameter. If you use weights, you cannot specify an error model except the constant error model. Various optimization methods have different requirements on the function that is being minimized. For some methods, the estimation of model parameters is performed independently of the estimation of the error model parameters. The following table summarizes the error models and any separate formulas used for the estimation of error model parameters, where a and b are error model parameters and e is the standard mean-zero and unit-variance (Gaussian) variable. 'combined': yi=fi+(a+b|fi|)e Error parameters are included in the minimization. nlinfit only support single error models, not multiple-error models, that is, response-specific error models. For a combined error model, it uses an iterative WLS algorithm. For other error models, it uses the WLS algorithm as described previously. For details, see nlinfit. If you are using a proportional error model during data fitting, avoid specifying data points at times where the solution (simulation result) is zero or the steady state is zero. Otherwise, you may run into division-by-zero problems. It is recommended that you remove those data points from the data set. DerivStep = max(eps^(1/3), min(1e-4,SolverOptions.RelativeTolerance)), where SolverOptions property corresponds to the model’s active configset object. FunctionTolerance	= 1e-6*f0, where f0 is the initial value of objective function. OptimalityTolerance = 1e-6*f0, where f0 is the initial value of objective function. Algorithm = 'trust-region-reflective' when 'SensitivityAnalysis' is true, or 'interior-point' when 'SensitivityAnalysis' is false. FiniteDifferenceStepSize = max(eps^(1/3), min(1e-4,SolverOptions.RelativeTolerance)), where SolverOptions property corresponds to the model active configset object. TypicalX = 1e-6 * x0, where x0 is an array of transformed initial estimates. Algorithm = 'trust-region' when 'SensitivityAnalysis' is true, or 'quasi-newton' when 'SensitivityAnalysis' is false. TolFun = 1e-6 * f0, where f0 is the initial value of objective function. FunctionTolerance = 1e-6 * norm(f0), where f0 is the initial value of objective function. FiniteDifferenceStepSize = max(eps^(1/3), min(1e-4,SolverOptions.RelativeTolerance)) , where SolverOptions property corresponds to the model active configset object. FunctionTolerance = 1e-6 * f0, where f0 is the initial value of the objective function. FunctionTolerance = 1e-6 * f0, where f0 is the initial value of objective function. InitialSwarmSpan = 2000 or 8; 2000 for estimated parameters with no transform; 8 for estimated parameters with log, logit, or probit transforms. scattersearch See Scatter Search Algorithm. The scattersearch method implements a global optimization algorithm  that addresses some challenges of parameter estimation in dynamic models, such as convergence to local minima. The algorithm selects a subset of points from an initial pool of points. In that subset, some points are the best in quality (that is, lowest function value) and some are randomly selected. The algorithm iteratively evaluates the points and explores different directions around various solutions to find better solutions. During this iteration step, the algorithm replaces any old solution with a new one of better quality. Iterations proceed until any stopping criteria are met. It then runs a local solver on the best point. 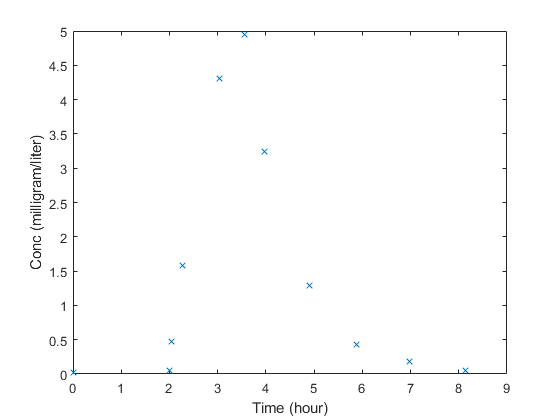 To start the scatter search, the algorithm first decides the total number of points needed (NumInitialPoints). By default, the total is 10*N, where N is the number of estimated parameters. It selects NumInitialPoints points (rows) from InitialPointMatrix. If InitialPointMatrix does not have enough points, the algorithm calls the function defined in CreationFcn to generate the additional points needed. By default, Latin hypercube sampling is used to generate these additional points. The algorithm then selects a subset of NumTrialPoints points from NumInitialPoints points. A fraction (FractionInitialBest) of the subset contains the best points in terms of quality. The remaining points in the subset are randomly selected. Define hyper-rectangles around each pair of points by using the relative qualities (that is, function values) of these points as a measure of bias to create these rectangles. Evaluate a new solution inside each rectangle. If the new solution outperforms the original solution, replace the original with the new one. Apply the go-beyond strategy to the improved solutions and exploit promising directions to find better solutions. Run a local search at every LocalSearchInterval iteration. Use the LocalSelectBestProbability probability to select the best point as the starting point for a local search. By default, the decision is random, giving an equal chance to select the best point or a random point from the trial points. If the new solution outperforms the old solution, replace the old one with the new one. Replace any stalled point that does not produce any new outperforming solution after MaxStallTime seconds with another point from the initial set. Evaluate stopping criteria. Stop iterating if any criteria are met. The algorithm then runs a local solver on the best point seen. The algorithm iterates until it reaches a stopping criterion. Relative change in best objective function value over the last MaxStallIterations is less than FunctionTolerance. Number of iterations reaches MaxIterations. OutputFcn can halt the iterations. Best objective function value at an iteration is less than or equal to ObjectiveLimit. Best objective function value did not change in the last MaxStallTime seconds. Function run time exceeds MaxTime seconds. You create the options for the algorithm using a struct. Handle to the function that creates additional points needed for the algorithm. Default is the character vector 'auto', which uses Latin hypercube sampling. The function signature is: points = CreationFcn(s,N,lb,ub), where s is the total number of sampled points, N is the number of estimated parameters, lb is the lower bound, and ub is the upper bound. If any output from the function exceeds bounds, these results are truncated to the bounds. 'off' or 'none' (default) displays no output. Numeric scalar from 0 through 1. Default is 0.5. This number is the fraction of the NumTrialPoints that are selected as the best points from the NumInitialPoints points. Numeric scalar from 0 through 1. Default is 1e-6. The solver stops if the relative change in best objective function value over the last MaxStallIterations is less than FunctionTolerance. This option is also used to remove duplicate local solutions. See XTolerance for details. Initial (or partial) set of points. M-by-N real finite matrix, where M is the number of points and N is the number of estimated parameters. If M < NumInitialPoints, then scattersearch creates more points so that the total number of rows is NumInitialPoints. If M > NumInitialPoints, then scattersearch uses the first NumInitialPoints rows. Default is the initial transformed values of estimated parameters stored in the InitialTransformedValue property of the estimatedInfo object, that is, [estiminfo.InitialTransformedValue]. Positive integer. Default is 10. The scattersearch algorithm applies the local solver to one of the trial points after the first iteration and again every LocalSearchInterval iteration. Numeric scalar from 0 through 1. Default is 0.5. It is the probability of selecting the best point as the starting point for a local search. In other cases, one of the trial points is selected at random. Character vector or string specifying the name of a local solver. Supported methods are 'fminsearch', 'lsqnonlin', 'lsqcurvefit', 'fmincon', 'fminunc', 'nlinfit'. If Optimization Toolbox is available, the solver is lsqnonlin. If Statistics and Machine Learning Toolbox is available, the solver is nlinfit. Otherwise, the solver is fminsearch. Positive integer. Default is the character vector 'auto' representing 20*N, where N is the number of estimated parameters. Positive integer. Default is 50. The solver stops if the relative change in the best objective function value over the last MaxStallIterations iterations is less than FunctionTolerance. Positive scalar. Default is Inf. The solver stops if MaxStallTime seconds have passed since the last improvement in the best-seen objective function value. Here, the time is the wall clock time as opposed to processor cycles. Positive scalar. Default is Inf. The solver stops if MaxTime seconds have passed since the beginning of the search. The time here means the wall clock time as opposed to processor cycles. Positive integer that is >= NumTrialPoints. The solver generates NumInitialPoints points before selecting a subset of trial points (NumTrialPoints) for subsequent steps. Default is the character vector 'auto', which represents 10*N, where N is the number of estimated parameters. Positive integer that is >= 2 and <= NumInitialPoints. The solver generates NumInitialPoints initial points before selecting a subset of trial points (NumTrialPoints) for subsequent steps. Default is the character vector 'auto', which represents the first even number n for which n2−n≥10*N, where N is the number of estimated parameters. Scalar. Default is -Inf. The solver stops if the best objective function value at an iteration is less than or equal to ObjectiveLimit. Function handle or cell array of function handles. Output functions can read iterative data and stop the solver. Default is . stop is a logical scalar. Set to true to stop the solver. optimValues is a structure containing information about the trial points with fields. bestx is the best solution point found, corresponding to the function value bestfval. bestfval is the best (lowest) objective function value found. iteration is the iteration number. medianfval is the mean objective function value among all the current trial points. stalliterations is the number of iterations since the last change in bestfval. trialx is a matrix of the current trial points. Each row represents one point, and the number of rows is equal to NumTrialPoints. trialfvals is a vector of objective function values for trial points. It is a matrix for lsqcurvefit and lsqnonlin methods. state is a character vector giving the status of the current iteration. 'init' – The solver has not begun to iterate. Your output function can use this state to open files, or set up data structures or plots for subsequent iterations. 'iter' – The solver is proceeding with its iterations. Typically, this state is where your output function performs its work. 'done' – The solver reaches a stopping criterion. Your output function can use this state to clean up, such as closing any files it opened. Positive integer, with default value of 22. If a particular trial point does not improve after TrialStallLimit iterations, it is replaced with another point. Logical flag to compute objective function in parallel. Default is false. Numeric scalar from 0 through 1. Default is 1e-6. This option defines how close two points must be to consider them identical for creating the vector of local solutions. The solver calculates the distance between a pair of points with norm, the Euclidean distance. If two solutions are within XTolerance distance of each other and have objective function values within FunctionTolerance of each other, the solver considers them identical. If both conditions are not met, the solver reports the solutions as distinct. To get a report of every potential local minimum, set XTolerance to 0. To get a report of fewer results, set XTolerance to a larger value. There are two ways to use parallel computing for parameter estimation. To enable parallelization for sbiofit, set the name-value pair 'UseParallel' to true. The function supports several levels of parallelization, but only one level is used at a time. For an unpooled fit for multiple groups (or individuals), each fit runs in parallel. For a pooled fit, parallelization happens at the solver level if the solver supports it. That is, sbiofit sets the parallel option of the corresponding estimation method (solver) to true, and the objection function evaluations are performed in parallel. For instance, gradients are computed in parallel for gradient-based methods. If you are performing a pooled fit with multiple groups using a solver that does not have the parallel option, the simulations run in parallel for each group during optimization (maximum likelihood estimation). You can also call sbiofit inside a parfor loop or use a parfeval inside a for-loop to perform multiple parameter estimations in parallel. It is recommended that you use parfeval because these parallel estimations run asynchronously. If one fit produces an error, it does not affect the other fits. If you are trying to find a global minimum, you can use global solvers, such as particleswarm or ga (Global Optimization Toolbox is required). However, if you want to define the initial conditions and run the fits in parallel, see the following example that shows how to use both parfor and parfeval. 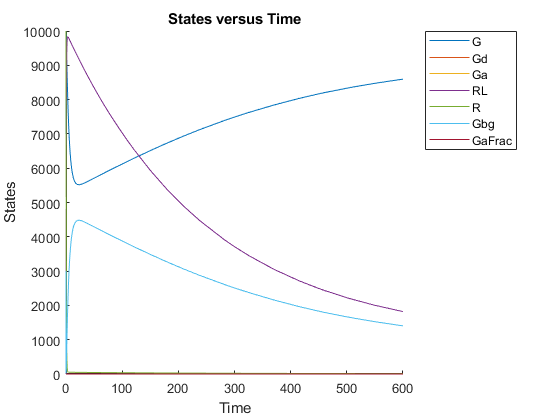 Store the experimental data containing the time course for the fraction of active G protein . Map the appropriate model element to the experimental data. Specify the parameter to estimate. Generate initial parameter values for kGd. Start a parallel pool using the local profile. Send the model to each worker. The following code ensures that the model is distributed only once to each worker. First, define a function handle that uses the local function sbiofitpar for estimation. Make sure the function sbiofitpar is defined at the end of the script. Perform multiple parameter estimations in parallel via parfeval using different initial parameter values. Summarize the results for each run. 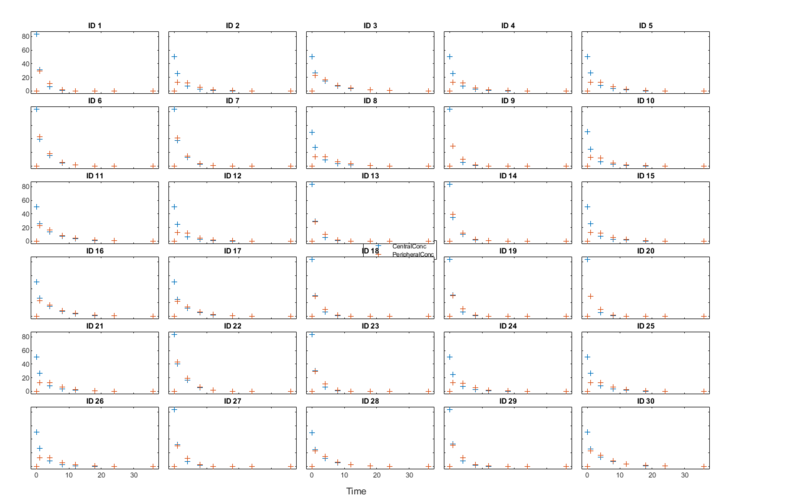 % Sort rows by LogLikelihood. Define the local function sbiofitpar that performs parameter estimation using sbiofit. Alternatively, you can perform multiple parameter estimations in parallel via the parfor loop. Make sure that your hybrid function accepts your problem constraints. That is, if your parameters are bounded, use an appropriate function (such as fmincon or patternsearch) for a constrained optimization. If not bounded, use fminunc, fminsearch, or patternsearch. Otherwise, sbiofit throws an error. For an illustrated example, see Perform Hybrid Optimization Using sbiofit. Yi, T-M., Kitano, H., and Simon, M. (2003). A quantitative characterization of the yeast heterotrimeric G protein cycle. PNAS. 100, 10764–10769. Gábor, A., and Banga, J.R. (2015). Robust and efficient parameter estimation in dynamic models of biological systems. BMC Systems Biology. 9:74.